The dream is over for MyPillow and its effort to rake in revenue by advertising that its pricey foam-filled pillow can treat or cure everything from insomnia to multiple sclerosis. As part of an agreement with consumer protection officials in California, Minnesota-based MyPillow has agreed to stop marketing its eponymous pillow as able to prevent, treat, or cure diseases or symptoms unless it has reliable scientific evidence to back up the claims as required by law. MyPillow, which was at the center of a TINA.org investigation, also must pay $995,000 in civil penalties and give $100,000 to homeless and domestic violence shelters in the state. In addition, MyPillow must stop promoting its product as the “official pillow” of the National Sleep Foundation — a claim which has helped boost annual sales to more than $100 million — after consumer protection officials alleged that MyPillow failed to disclose its “financial connection” with the foundation to consumers. However, MyPillow has until Jan. 31 to comply with this part of the agreement and the company looks inclined to run out the clock. In addition to still making this claim in its national TV ads, the MyPillow homepage also still touts that the product is the “official pillow of the National Sleep Foundation” without disclosing its material connection with the foundation. In an effort to halt the continued deceptive use of the “official pillow” designation, TINA.org, in a Nov. 15 letter, called on the foundation itself to take action. TINA.org provided information to the consumer protection officials regarding several of these deceptive marketing issues following its own investigation of MyPillow and subsequent warning letter to the company earlier this year. The California agreement stems from a lawsuit filed last month by the Alameda County District Attorney and nine other counties that focused on MyPillow’s unsubstantiated claims to treat conditions such as insomnia, sleep apnea and fibromyalgia and the company’s cozy relationship with the National Sleep Foundation. The lawsuit alleged that MyPillow “knew or reasonably should have known” that the marketing claims were likely to mislead consumers. “Companies making millions from unsupported health claims that are warned by TINA.org to halt their deceptive marketing practices are going to pay a price if they don’t comply,” said TINA.org Executive Director Bonnie Patten. 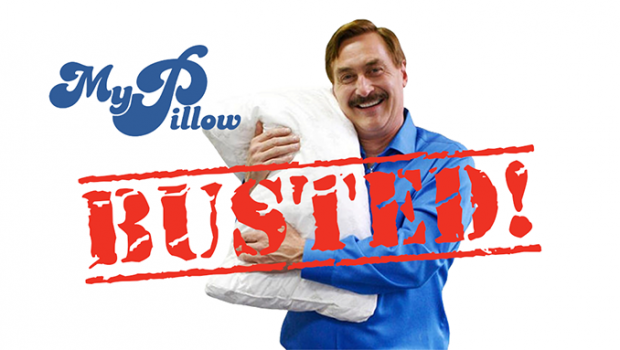 In an interview, MyPillow founder and CEO Michael Lindell noted that MyPillow did not admit any wrongdoing in the California case. He said the company settled in order to avoid the cost and time associated with further litigation. But MyPillow has been facing legal action on several fronts since TINA.org first put the company on notice in February regarding unsubstantiated health claims for its heavily marketed pillow. (The company spends $1.4 million a week on advertising, according to the Boston Herald.) Since then, three class-action lawsuits have been filed against MyPillow, all of which, in one form or another, mirrored TINA.org’s findings. These findings include claims that Lindell is a “sleep expert” despite having no specialized training or board certification in actual sleep medicine (see below); the misuse of several news organizations’ logos, including The New York Times that falsely suggests endorsements by the media outlets; and the misleading nature of the company’s ubiquitous buy-one-get-one-free pillow offer. Citing consumer complaints about the BOGO offer, the BBB in January 2017 revoked MyPillow’s accreditation and lowered its rating from an A-plus to an F.
One of the three class-action cases has reached a preliminary settlement that would require MyPillow to refund consumers who bought the pillow $5 per household. It would also prohibit the company from making unsubstantiated health claims nationwide. In August, MyPillow also agreed to pay $1.1 million to settle a whistleblower case handled by the New York attorney general’s office that alleged it knowingly failed to collect sales tax on Internet and phone sales of pillows marketed in New York. In response to TINA.org’s February warning letter, which threatened to notify the FTC of its findings if the company did not make the necessary changes, Lindell made repeated assurances to TINA.org that the deceptive marketing would be corrected. One of the more conspicuous changes to the company’s marketing took place on the MyPillow homepage, where claims to treat insomnia, sleep apnea and fibromyalgia, among other conditions, vanished less than a week after TINA.org sent the warning letter. But testimonials purporting to treat the same conditions that had been scrubbed from the homepage kept surfacing elsewhere on the company’s website. On the topic of the National Sleep Foundation’s “official pillow” designation, Lindell told TINA.org that the foundation approached him years ago and that MyPillow did not pay for the approbation. He said he was unaware that the foundation also sold the MyPillow on its website. But now that MyPillow can no longer promote its pillow as the foundation’s “official pillow” the foundation itself no longer sells it. Might one have to do with another? Of that you can be rest assured. Read more about TINA.org’s investigation of MyPillow here.